"We stand on the summit of 150 years of Church history; yet there are other summits to climb before the work of God is crowned with victory. 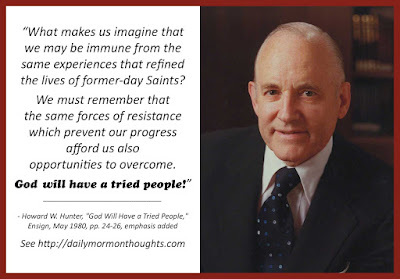 There will be tribulations collectively and hardships personally—that resistance so essential to the eternal plan. 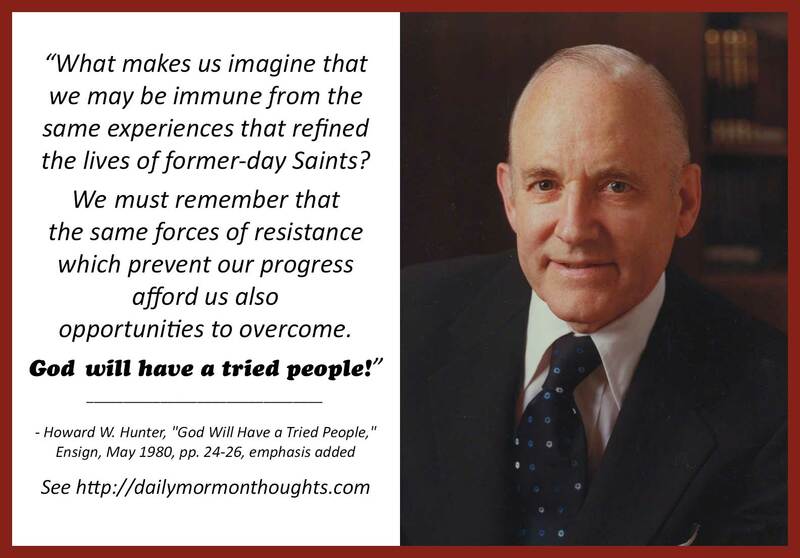 "What makes us imagine that we may be immune from the same experiences that refined the lives of former-day Saints? We must remember that the same forces of resistance which prevent our progress afford us also opportunities to overcome. God will have a tried people! We sometimes reflect with awe on the lives and examples of those in the past. President Hunter suggests that many new "biographies of faith" are being written by those today who are struggling with great challenges in their own way. Those challenges include physical pain, emotional sorrow, disloyal friends, wandering children, loss of family support, loss of health, financial problems, and so on—the list is long. So many of life's challenges are part of the "refining" process that brings us true progress! 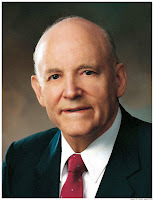 That's where our faith enables us to not only survive the challenges, but to remember the Lord's truly remarkable promise that "all things shall work together for [our] good" (D&C 90:24) when our hearts are filled with love for God and trust in his eternal plan, and our lives demonstrate that faith in our deeds.